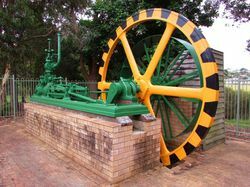 A steam engine commemorates the former employees of Mitchell Bros Sawmilling Company. The Mitchell timber mill was constructed in the early 1900s in the centre of town opposite the harbour. The mill was a major supplier of timber throughout New South Wales and a large employer of local people. 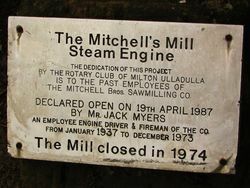 In 1939 bushfires burnt down the mill but it was reconstructed and the Mitchell steam engine introduced, which continued to operate until 1973. Mr Ted Walker, a longtime member of the Milton-Ulladulla Rotary Club, persuaded the Council to retain the steam engine when the mill closed. THE MITCHELL BROS, SAWMILLING CO.
AN EMPLOYEE ENGINE DRIVER & FIREMAN OF THE CO.
FROM JANUARY 1937 TO DECEMBER 1973.